I made a CD using ISO image. Then when started GParted application a lot of strings are untranslated (in English). the GParted Italian translation seems complete. Why GParted in ISO image didn't contain Italian language updated? Thank you for posting the instructions on how you started GParted. It would help if you had also provided details on which strings are not displayed in Italian. Lacking this information I started GParted and it would appear that the strings for the stock toolbar items are not translated (e.g. "Delete"). The stock icons come directly from GTK2. For example the "Delete" toolbar button is configured in src/Win_GParted.cc - line 248. From looking at the code the text "Delete" is never mentioned so this text must be coming directly from the GTK2 stock. Unfortunately the text "Delete" no longer appears to be translated in newer distros, such as Debian SID which we use as the base for GParted Live. Some further research indicates that the GTK2 stock icons are now deprecated. See Gtk.stock is deprecated, what's the alternative? Currently GParted uses GTK2; however, work is in progress to migrate to GTK3. See Merge Request 9 - GParted GTK3. Perhaps the problem can be addressed after the GTK3 migration. No one of other translator reported that? "non allocato" should be "Non allocati" (plural and first letter in uppercase). The original Italian terms are used in singular because are think as "space" but if you make a size nearby should be mentioned as plural because is relative to bytes. It seems that no one test the translation in place. Tomorrow morning I will check the GParted menu. I remember that seems also in the menu there are some strings untranslated. Under GParted menu the string "Quit"
Under Partizioni (Partitions) menu the strings "Copy" / "Paste" / "Information"
Under Aiuto (Help) the string "About"
In any small confirm window where the is a "Cancel" button it's untranslated. All the translations for GParted are managed by the GNOME Translation Project. If you discover incorrectly translated strings then the GNOME Translation Project is the team to contact. I think the issue with GTK2 Stock icons (with names) may need to wait until after the GTK3 migration. And what's about the menu options untranslated? The Menu options also use GTK2 Stock. For example the "Quit" option is located in src/Win_GParted.cc at line 170. Notice that the text "Quit" is not in the GParted source code, but rather is handled by GTK2 Stock. Hence whatever fixes the issue for the GParted toolbar will also fix the problem with the GParted menu. Interestingly I booted a Debian Live 9.6 xfce image in a virtual machine, installed and ran GParted. Notice in the above screen shot that the text names are missing from the toolbar. 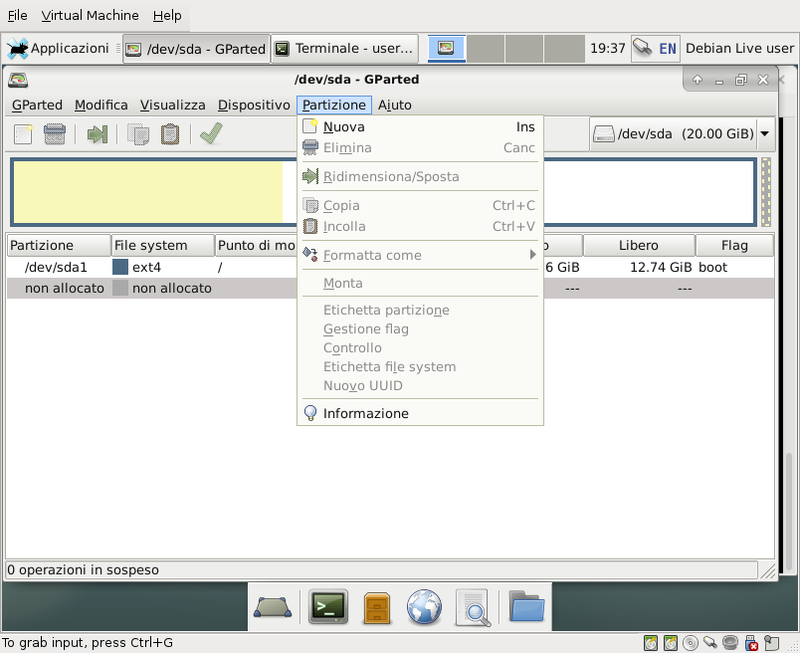 Further the names in the GParted Partition menu are shown as translated. The reason for the difference might be the older version of Debian (Stretch instead of SID), or it might be due to something like a missing package. The difference might also be due to a different window manager (XFCE versus Fluxbox).